Reed and Steve tackle listener feedback about ammo and AR-15 barrels. 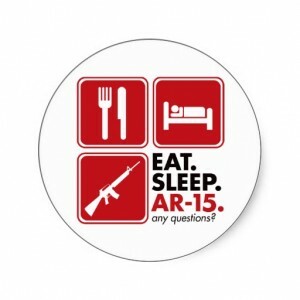 Welcome to episode #32 of the AR15 Podcast. I’m your host Reed Snyder and joining me tonight as Co-host is Steve, from Gun Guy Radio. This is THEE podcast about your favorite black rifle! This show is for you; whether you're building your first AR or you’ve been building ARs for years. There’s something we can all do to take our black rifle to the next level. When shooting prone, if your body structure allows you to do so, it is OK to rest your magazine on the ground. Many people believe it will cause misfeeds or other malfunctions but I have found this is not so. Resting your magazine on the ground provides a very stable platform for shooting and will help your group sizes when shooting in the prone position. Give it a try and send us some feedback on how it worked for you next time you go to the range. 1. The upper I'm building will be my long range upper, so accuracy is key. I've heard that with a 223/5.56 barrel the 5.56 ammo is going to be more accurate because the 223 bullet is a little smaller and kind of floats in the barrel somewhat? I'm only going to use 223 ammo (cost and availability), are there barrels that are 223 only that are more accurate than a 223/5.56 barrel? Or does it not make that big of a difference and I should just get a 223/5.56 Wylde barrel? 2. Ok, so for my barrel, when I say long range, what I mean is somewhere around 6 inch groups at 500-600 yards. Since I have no previous experience, I don't know if that's a reasonable expectation or not. I want to come in at or under $300. I found a couple barrels in that price range but I'm not sure if they'll deliver the results I'm looking for. If there's a different barrel you'd suggest or if I have to spend more than $300 to get those results, I will, but I don't want to unless I have to, you know? So my real question is, what barrel would you get if you were in my shoes and had that grouping requirement? 3. Perhaps you can do some more info on ammo selection, for target, and defense shooting, as well as hunting rounds that folks use. This may get a bit technical, but if you can talk about the speed of those rounds, as compared to the test barrels and such. I know if you look at the data provided by ammo makers, the velocity stated does not always match what you get out of your rifle. This of course will effect the impact of the bullet at range. So if you have one of those BDC scopes, the dial rings for the ranges may not be what they are advertised as. Yes, you need to find out what works for you, but many of us don't have access to a good 300 to 500 yard range. How best can you go about doing a scope zero when you many not be able to shoot at 200+ yards. 4. I shoot a lot of prairie dogs and a 20" barrel is sometimes a pain to get in and out of the truck all day long. Wondering if you have seen any stats on the comparison between a 20" and 16" barrel. I only shoot up to 300 yards at varmints. So if the difference isn't much out to that distance I would like to switch out my barrel. What is the difference one will see in accuracy when shooting different ammo (high vs. low price range)? Possible accuracy gained via reloading. Types of 5.56/.223 bullets including FMJs, hollowpoints, boat tailed bullets, etc and effect on accuracy, penetration and home defense capabilities. Which bullet grain weights are best for which application as well as barrel twist rate. Any other ammo related questions or topics you may have. FEEDBACK: Hi Steve, Love the show and look forward to each episode. I've been shooting AR's for about 20 years. I was the first one to shoot it in the local High Power matches. I got a lot of sideways looks from the Garand crowd until I started winning events, then more and more AR's started to show up... With the right hand load, my competition AR will shoot 1/2" groups at 100 yards. I can give a thumbs up to the Otis cleaning system, they work great and are much better for the bore than regular cleaning rods. Plus they are so much easier to pack than the full length stainless rods I used to use. I can't tell you how many rods I bent or lost over the years. Please enter me in the contest. Joe T.
A big THANK YOU to Otis Technology for being kind enough to sponsor this giveaway. You can visit Otis Tec at otistec.com. Otis Tec manufactures the most advanced gun cleaning systems and accessories in the world. Don’t forget to tell them you heard about them on the AR15 Podcast and the Firearms Radio Network. If you’d like to enter in the Otis listener giveaway, send an email to steve@ar15podcast.com or reed@ar15podcast.com. Provide us with some feedback, questions or topic suggestions and don’t forget to mention you would like to be entered in the giveaway.